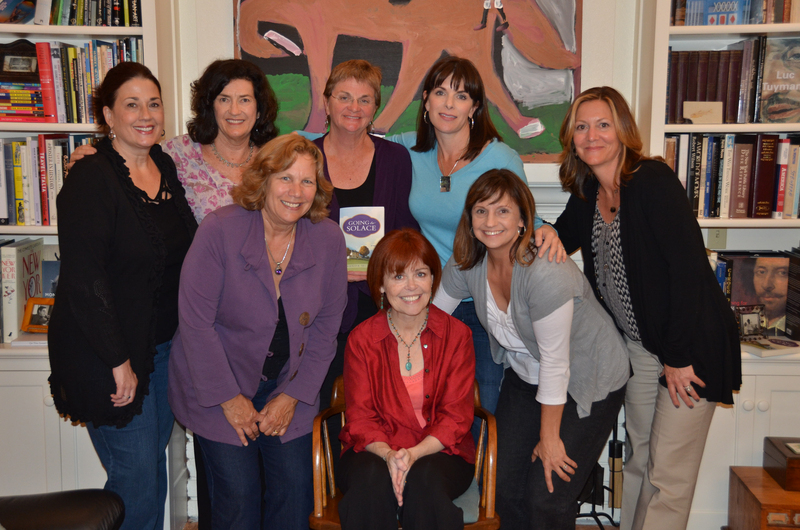 Then last night I met — for the very first time in this author’s life — with a book club that had read my novel, Going to Solace. Wow. So amazing to sit among folks who know the book as well as I do, who favor this character or that, who chafe when characters fail no matter how good their reasons might be, who worry about how a particular character might fare beyond the book’s end. Reading Between the Vines: that’s what the club is called, a nod to our mutual home in wine country. The members have overfull lives, lists of to-dos, but they put that all aside once a month — they’ve been doing so for 13 years now — to talk about a book, a book they’ve had to carve out the time to read. They change it up. One month it’s classical, the next kitsch. Sometimes it’s fiction, sometimes non-. A review copy of Going to Solace went to the leader, she loved it and — Bam — there we were last night eating dinner in stages all over the house, sipping and blabbing, chewing and blabbing — sharing reading. We talked around the book — the who and how of its long unfolding through writing into publication. We also wandered inside the book, trading questions and insights. * The panel featured Anita Amirrezvani, author of Equal of the Sun; Amanda Coplin, author of The Orchardist; and C.W. Gortner, author of The Queen’s Vow. Author. Director. Teacher. My debut novel, GOING TO SOLACE was named one of four "Best Reads of 2012" by public radio's KRCB "Word by Word." A collection of short stories, "Convergence," is due out in 2015. A second novel, "Monkey Bottom," will follow. This entry was posted in Going to Solace, PAGE, Publishing and tagged Amanda Coplin, Amanda McTigue, Anita Amirrezvani, Book Club, C.W. Gortner, Equal of the Sun, Going to Solace, Harper Davis, literary fiction, Litquake, novel, The Orchardist, The Queen's Vow, Women's National Book Association. Bookmark the permalink. What a treat, with ready-made fans. Congratulations.